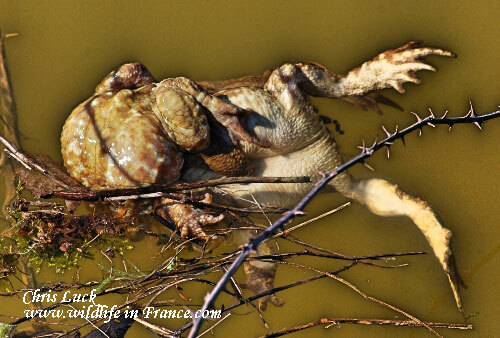 Until recently it was thought that the Common Toad Bufo bufo was the species that occupied most of France and that the sub-species Southern Common Toad, Bufo bufo spinosus, was only to be found in the South of France. With little if any obvious external difference that assumption remained the case until genetic studies were conducted that turned everything on its head. 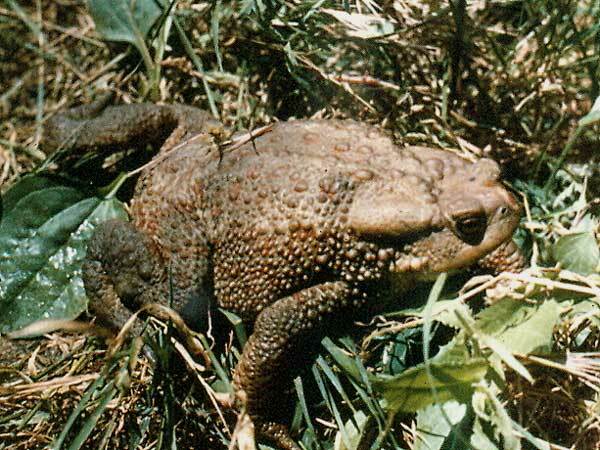 It turned out that it is Bufo bufo spinosus that occupies most of France with Bufo bufo only in the North East of the country. With this in mind it it is only necessary to describe their biology and behaviour together. These toads can reach 19cm in length in the case of females with males being considerably smaller. Back and upper surface can be brown, grey or greenish with dark spots and the tone can be altered according to surroundings. The underside is cream or grey. They have a large head with a rounded nose and their eyes are copper or gold with horizontal slit pupils. The skin is warty and can excrete toxins when threatened which deter predators. Back feet are partially webbed. 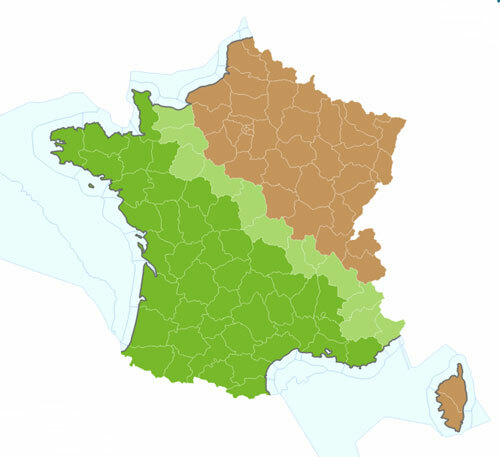 They can be found living in all types of habitat in France generally with no apparent fear of human contact and they are adaptable to saline water in coastal regions. 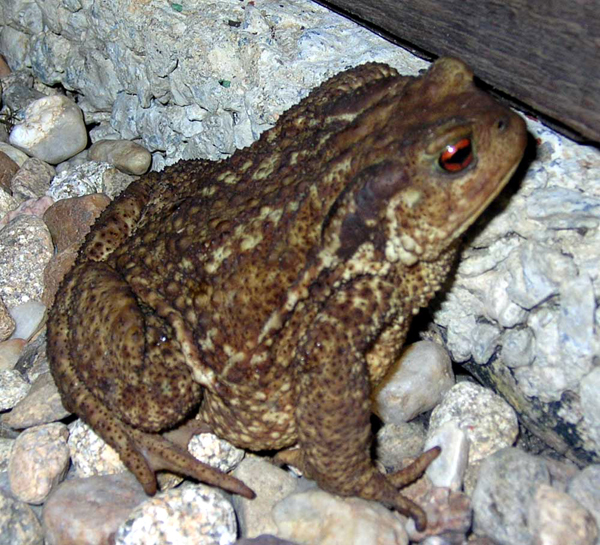 In your garden a common toad will frequently use the same place of cover for months under a piece of wood, a rock or some other niche and regularly patrol the same territory in search of food. They are excellent swimmers and climbers with the main periods of activity at dusk and during the night. When disturbed they crouch on the ground and inflate their bodies. Hibernation commences in October in a hole in the ground or any type of cavity, even in a barn or shed. 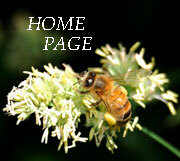 It will not be unusual to find several individuals together in a good location. Reproduction starts in March in a pond or lake and it is likely that they return to their birth place where they gather in large numbers. There seems to be some preference for water where fish are present, this presents no real problems for the tadpoles due to their toxic skin. Males fight furiously for a female and a single female can have as many as ten males on top of her in a heap which sometimes ends with the female being crushed or drowned, part of the difficulty is caused by the spawning process whereby she swims around laying the spawn in long strands which are fertilised by a male that has attached himself with a firm grip. Anything from 200 to 7000 eggs can be produced by a single female, 1500 being typical. ABOVE: It isn't unusual for females to be drowned during the mating season. This one had probably been held under by the weight of several males the previous night. Click to download soundfile - Common toad. Although common and widespread with large populations there has been an overall decline in numbers due to loss of native ponds and wetland destruction, garden ponds have provided some compensation. Map shows approx division of the two species.